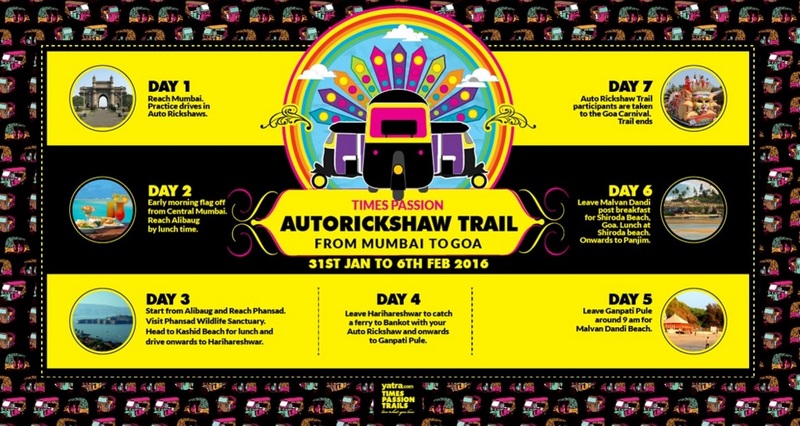 Auto Rickshaw Trail – Why it should not be missed? Yes you heard it right!! Times Passion trail is back with another chance to experience all the things you always wanted to but didn’t. Travelling is soothing and when it comes to absolutely stunning road trips engulfed in natural beauty, who wants to spend a vacation doing anything else? The Times of India and Yatra.com’s next trail is the absolute joy ride you require and the road trip one should desire. They will be taking 30 participants on an unforgettable experience from Mumbai to Goa, and that too on Auto Rickshaws decorated in different colors. The trail will end in Panaji, Goa on the 6th of February which marks the beginning of the Goa Carnival. Hence, all the participants can eventually take part in one of the amazing carnival. So don’t miss this and be part of something astonishing.. REGISTER Now!